Lana did not move the pups last night, and this morning, we observed her nursing them. These are good signs that she really doesn't mind the socialization sessions. For the first time, one of the pups has ventured out onto the straw in front of the den. At first, we were concerned that he or she may have tumbled out accidentally, but he or she soon crawled back into the den on his or her own. Today, both of us touched all three pups. 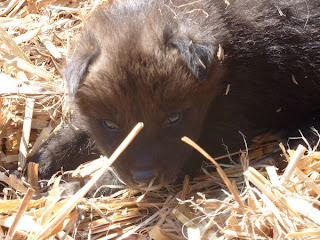 One of the pups growled a little at both of us.